Above: ALTRINCHAM FC YOUTH TEAM 2005-06, Back row: Tony Spilsbury (coach), Rick Crawford, Michael Risk, Dean White, Reza Zareh-Ourang, Lewis Bishop, Tom Barclay, Danny Chebrika, Ben Shanks-Pepper, Ashley McGrath, Hassan Zareh-Ourang, Danny Gray, George Heslop (manager). Front row: Astley Mulholland, Andy Keogh, Ben Deegan, Richard Gresty (capt), Matty Williams, Anthony Davies. All framed pictures on this site are enlargeable; just click on the images themselves. Altrincham's Youth side is managed by George Heslop, ably assisted by coach, Tony Spilsbury. The team plays in the North West Allied Trophies (Under-18s) Premier Division. I am very grateful to George for his help in providing information for this page. If anyone else has information on the Youth team, I am always happy to receive it. You can e-mail me here. John Laidlar. 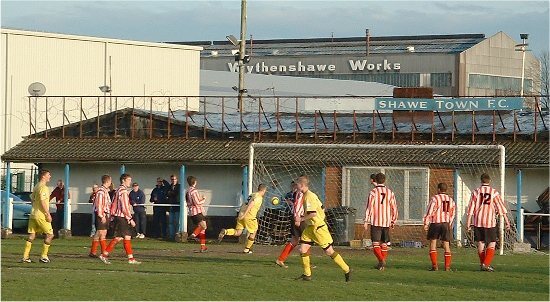 Altrincham FC Youth play their league and league cup games at Wythenshawe Town FC. Map of Wythenshawe Town ground area. FA Youth Cup games are played at Moss Lane. 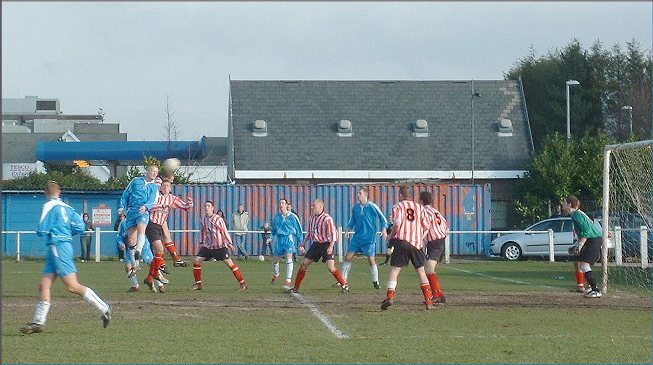 Altrincham & District FA games are usually held at Trafford FC, Shawe View. As previously announced, the FA Youth Cup First Qualifying Round placed Altrincham at home to either Midlands side Handsworth United or Holker Old Boys from Cumbria. However, Holker Old Boys have now withdrawn leaving Handsworth United as our opponents. The game will be played at Moss Lane on Wednesday 27th September. 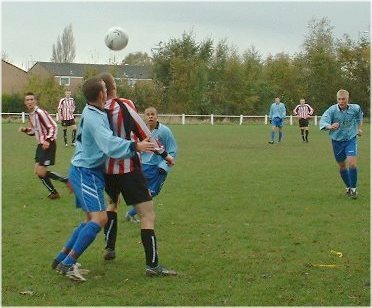 The winners would then be away to Winsford United or Worksop Town in w/c 9 October 2006. 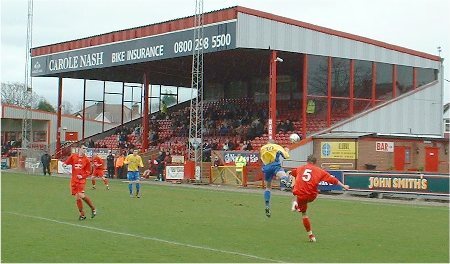 The 3rd QR is a fortnight later, the week commencing Monday 23 October 2006 and if they reach it, Alty would be at home to one of Workington or Vauxhall Motors or Ashville or Morecambe. No fixtures have yet been issued for the NW Youth Alliance. The league does not start until early September and it is believed that the Premier Division will comprise ten clubs. 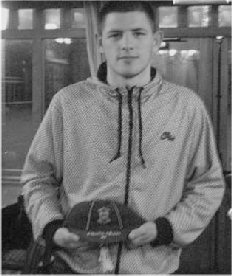 A few days ago the website reported that last season's Alty Youth captain Richard Gresty, who also played for Alty Reserves and for the English Colleges XI, had broken his cheek bone in the Umbro Tournament last week. It now emerges that the injury (sustained playing for a Sale side ironically against the current Alty youth team), which came from an accidental elbow to the face was a serious one. An ambulance was summoned and Richard was given oxygen whilst still on the field. He was then taken to hospital where X-rays confirmed no less than 4 fractures to his cheekbone. He was kept in overnight and was to be operated on the next day. This was delayed, however, as following concussion, a full anaesthetic could have been dangerous. He now has to go back to hospital on August 11th when he will have a metal plate fitted to the bone (reconstructive surgery) and will be unable to play for approximately 6 weeks. All at Altrincham FC wish him a full and speedy recovery. The Wirral (Home) by 19 November. Leek Town went on to win the competition. Alty Youth's leading scorer last season, Ben Deegan, celebrates his 18th birthday this Thursday (13th) and the management and club send him their congratulations. Alty Youth will be holding trials for next season on Saturday, 1 July. Anyone interested in attending should contact manager George Heslop in advance by ringing him on either 0161 718-0624 or 07939-9890503. Altrincham Youth also invite sponsorship for next season to help meet the costs of approaching £4,000 for travel and training costs. Again, if you can help, please contact George Heslop, as above, or ring the club on 0161 928-1045. In the European Colleges' tournament, Alty's Richard Gresty played in England's winning side in the third-place play-off. "Gresty justified his selection by dominating after a nervy start by both sides" says the NL Paper. A report on Alty Youth's defeat by Morecambe in the Neil Thomason Trophy Final is now here. Alty's Hassan Zareh-Ourang (7) latches on to a loose ball against Morecambe. Altrincham Youth have won three cups this season but, sadly, they were unable to win the inaugural Neil Thomason Trophy last night against Morecambe at Woodley Sports FC, a game they played without captain Richard Gresty and Players' Player of the Year, Andy Keogh. Anthony Davies's goal had put Alty ahead at the interval but Morecambe came out strongly in the second half. Alty's cause was not helped by injuries to Hassan Zareh-Ourang and Matty Williams which saw both players have to be substituted, whilst Ben Deegan also suffered an injury. Morecambe got level with a penalty after the ball had bounced up against Ashley McGrath's hand and then went 2-1 up. With Alty chasing an equaliser, two late goals made the score 4-1, which was a little harsh on the Altrincham side. Report to follow. 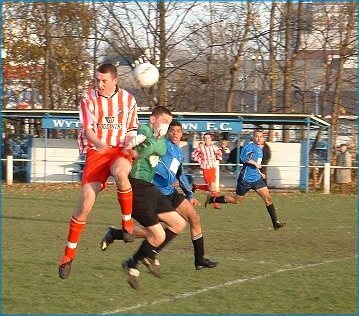 There may be only 33 days to the first-team's first friendly of the 2006-07 pre-season but the Altrincham Youth Team has yet to complete the 2005-06 campaign. Tonight (Tuesday), they attempt to win their fourth cup of the season as they take on Morecambe "A" in the first final of the Neil Thomason Memorial Trophy at Woodley Sports (7.45pm k.o.). Neil was formerly the coach of Alty Youth and winning the trophy would mean a lot to manager George Heslop and the lads, so please come along and support them if you can - entry is expected to be free. Alty will, however, be without captain Richard Gresty who played in the English Colleges' first match of their international tournament in Italy this weekend. England beat Spain 2-1 and meet Northern Ireland in their next match. If they win that, they will play the hosts, Italy. Above: Altrincham Youth team with their three trophies. L to R back row: Tony Spilsbury (coach), Michael Risk, Rick Crawford, Reza Zareh-Ourang, Ashley McGrath, Stefan Fielding, Ben Deegan, Andy Keogh, Lewis Bishop, Kieran Raynes, Tom Barclay, Julianne Gresty (physio). Front row: Hassan Zareh-Ourang, Matty Williams, Astley Mulholland, Richard Gresty, George Heslop (manager), Anthony Davies, Danny Browne, Dean White. Thursday witnessed the fifth annual Altrincham FC Youth Team Presentation Night. Though not successful in the league, the Youth team have lifted three cups this season and have the chance of a fourth next Tuesday when they play Morecambe in the Neil Thomason Memorial Trophy Final at Woodley Sports (7.45pm). As manager George Heslop said, he is especially keen to win that cup as it commemorates his former colleague, Youth team coach Neil Thomason who died last summer at a young age. Please come along and support the lads in their attempt to honour Neil in the best way they can. 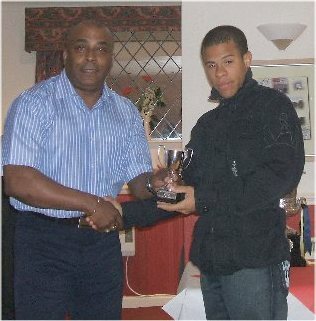 Left: Astley Mulholland receives the Clubman of the Year award from Dalton Steele. The Presentation Night was again expertly compered by Jo Ryan and the club was very grateful to its guests, Mr Ken Leitch (Assistant Secretary of the Altrincham and District FA) and Mr John Gardiner (Fixture Secretary of the NW Allied Trophies League). Mr Leitch presented awards to the lads who had represented the Altrincham & District FA and won the Cheshire County FA District Youth Cup. Mr Gardiner presented medals to the youth team for their triumphs in the Open Cup and Premier Subsidiary Cup. Another welcome guest was Mr Brian Flynn, who presented the STAR Jackie Swindells Trophy for the Manager's Player of the Year to Ben Deegan who smashed the goalscoring record this season. 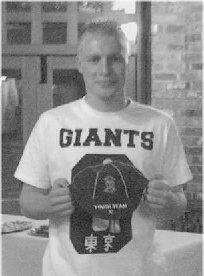 First team Player of the Year, Peter Band, handed over Players' Player of the Year award to midfielder Andy Keogh, who was on crutches due to a metatarsal injury. Alty assistant manager Dalton Steele suffered some barbed comments about his age from the Peter Pan of youth team football (George Heslop) but nevertheless good humouredly presented the new Clubman of the Year award to Astley Mulholland. 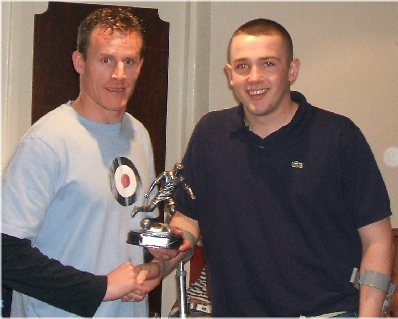 Right: Ben Deegan receives his Manager's Player of the Year award from Brian Flynn..
Deserved awards were also made to coach Tony Spilsbury and physio Julianne Gresty, as well as to Jenny Heslop for her labours in getting the kit washed, putting up with George and staffing the bar for this event. Appreciation was also expressed to Karen and Sarah Rowley for producing an excellent buffet and to Jo Ryan for her efficient organisation and running of the event. In George Heslop's review of the year, he revealed that the team had played 36 matches in all this season, to date, winning 27, drawing once and losing 8, whilst scoring a phenomenal 132 goals and conceding 49. In cup matches alone, they lost just one of 17 ties, in the FA Youth Cup at Selby Town, scoring 56 times and conceding just 17 times. George also paid tribute to those players to win representative honours, notably Richard Gresty who is about to depart for Italy for the English Colleges team. As well as Richard, both Ben Deegan and Anthony Davies had also represented Cheshire FA, whilst Danny Gray and Ashley McGrath had played for the Manchester FA side. A most enjoyable evening was completed when Peter Band and Dalton Steele joined Sarah Rowley to draw the teams and names for the club's World Cup fundraising competition. 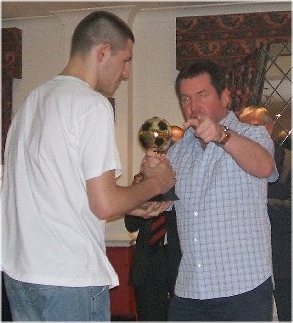 Left, Peter Band, Altrincham FC first team Player of the Year, presents midfielder Andy Keogh with the Youth Team Players' Player of the Year Award. Marine confirm that "The young Mariners were crowned Champions last night after a 3-0 win over Altrincham. Marine needed 3 points from the last game to win the league. For the first 25 minutes the game could have gone either way on 35 minutes Kyle Hamid produced the move of the half picking the ball up just inside the opponents half he turned and played a perfact ball out to Peter McShane on the right wing the winger went past his marker and put a great ball in to the far post and there was Hamid to head the ball towards the goal the keeper could only parry it away and Hamid picked up the loose ball and from a tight angle curled the ball in to the goal at the far post. half time 1-0. In the second half Marine started off the better team and it wasn't long before Marine made it 2 - 0 with another goal from Kyle Hamid who ran on to a through ball from Michael Grant and after his first shot came back off the goalkeeper he made no mistake with his second chance putting the ball in the top corner. 2 - 0. It was all Marine now and with 20 minutes to go, Ryan Liggitt put Marine 3 - 0 up with a sweetly struck left-footed volley that creeped inside the far post. Congratulations to all the lads. Team: S Burke, L Crosbie, M Grant, D Rice, S O'Rourke, P McShane, T Sumner, M Deakin, M Christian, R Liggitt, K Hamid. Subs: M Smith, A Wong, S Hooper, A Clarke, J Manning. Andy Keogh has been suspended for a sending-off against Bootle. Under new FA rules he is banned until the Alty first team has completed three matches next season! 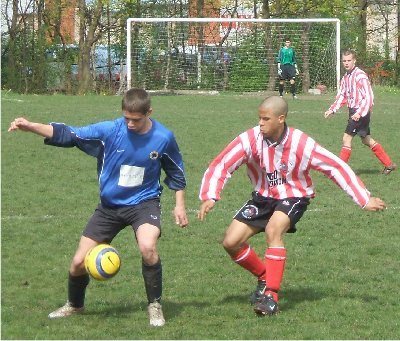 He will miss the final Youth team league and cup matches this season and also however many Alty Reserve games, (for which he would be eligible in 2006-07), that may take place before the first team complete three matches in August! Richard Gresty will also miss the Marine league game this Tuesday as he prepares for the English Colleges tour and Stefan Fielding is also out due to exam commitments. As previously reported Alty Youth captain Richard Gresty is playing for the English Colleges team on their tour of Italy. Before then the national side plays a friendly against a Watford side on the 17th May as a warm up game. The Colleges' squad flies out to Italy on the evening of Sunday 28th May. The tournament in Italy brings England up against sides from the host country as well as Malta, Northern Ireland, Poland, Romania, San Marino, Slovenia and Spain before the players return home late on Monday 5th June. Hopefully Richard will obtain international clearance before he returns to Altrincham! Thanks to Julianne Gresty for this information. The Altrincham Youth team has had a successful season, winning two cups as Altrincham FC and a third as the Altrincham & District FA side. They also have another final to contest on May 23rd, the Neil Thomason Memorial trophy at Robin Park, Wigan (8pm). On May 25th there will be a Youth Team Presentation Night in the Noel White Suite starting at 7.30pm (for 8pm). It is hoped that a first team player will be available to make the Players' Player award, whilst a STAR rep will present the Manager's Player of the Year award. The event may include a hot pot supper, in which case a charge will be made but details will be clarified in due course. The Youth team's last league fixture has now been set for Tuesday 16th May, away at Marine. Congratulations to Alty Youth team's captain and centre-back, Richard Gresty, who has been selected for the English Colleges team and will leave on 28 May for the Colleges' one-week footballing tour of Italy. There was some doubt about who scored the winning goal for Alty Youth in the Open Cup Final last Sunday. The goal has now been credited to Ben Deegan, rather than Anthony Davies, whose freekick was touched in by Ben. I am indebted to Julianne Gresty for these two photos of Alty Youth players Richard Gresty (left) and Ben Deegan (right) receiving their Cheshire County FA caps recently. A report on the win over Marine in the Open Cup Final is here. Alty display the Open Cup. Alty Youth scored two late goals to clinch the Open Cup Final 2-1 against Marine this afternoon at Ashton Athletic's ground. The goalscorers were Andy Keogh and Anthony Davies (though Ben Deegan may also be claiming the latter goal). They have now won two cups inside a week and on May 23rd meet Morecambe in the Neil Thomason Trophy final, so could win a third trophy this season. The Altrincham FA side has also already won the Cheshire FA District Youth Cup, comprising a complete team of Altrincham FC's players. Congratulations to Richard Gresty and Ben Deegan who have now both been awarded their Cheshire FA County caps; these are normally awarded after ten appearances for the Cheshire FA side. Leading 2-1 from the away leg, Alty Youth scored five times without reply in Thursday's second leg of the NW Allied Trophies League Premier Subsidiary Cup at Wythenshawe Town. Two goals in three minutes from Hassan Zareh-Ourang (30 and 33 mins) set Alty on their way before Ben Deegan scored from 25 yards or more just before the interval. Second half goals from Danny Gray (62 mins) and Rick Crawford (72 mins) completed an excellent performance. Match report here. 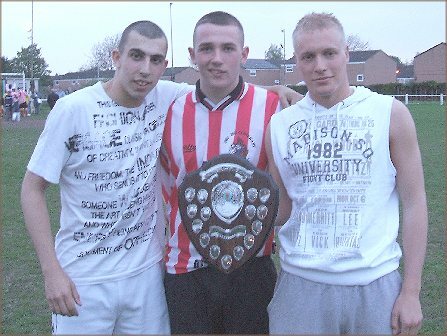 Right: As dusk fell at Wythenshawe Town, Alty received the shield for winning the Subsidiary Cup. Pictured, left to right, are Matty Williams, Andy Keogh and team captain Richard Gresty (who missed the match through injury). Alty Youth took a one-goal lead from Tuesday's first-leg of the NW Allied Trophies' Premier Subsidiary Cup at Woodley Sports. Alty took a two-goal lead thanks to Andy Keogh and a penalty from Ben Deegan, the latter arising when Alty keeper Fielding's kick led to Matty Williams being hauled back inside the box. Sports scored a late penalty themselves but Alty went away with two away goals, which would count double in the event of a tie after the second leg, which takes place at Wythenshawe Town on Thursday 4th at 6.30pm. Please come along and help support the Altrincham lads - entry is free. However, Alty's success was tempered by injuries. Captain Richard Gresty had to go to hospital with what is feared may be a recurrence of of his ankle ligament injury, whilst Matty Williams and Andy Keogh also picked up injuries. It is believed that both Accrington Stanley and FC United of Manchester will field youth teams in the NW Allied Trophies League next season. In another physical encounter with Bootle, Alty allowed a two-man advantage and a lead to slip. Alty had Andy Keogh sent off in the first half before the hosts had three men sent off. Shortly before the interval, Alty keeper Lewis Bishop was stamped in the chest and had to be taken to hospital. Alty had recovered from trailing 0-1 to lead 3-2 before two badly conceded goals allowed the hosts to emerge victorious. Alty Youth are away today at Bootle. On Tuesday they are away at Woodley Sports in the first leg of the Subsidiary Cup Final and then on Thursday (4th), the second leg will be played at Wythenshawe Town - both games are at 6.30pm. 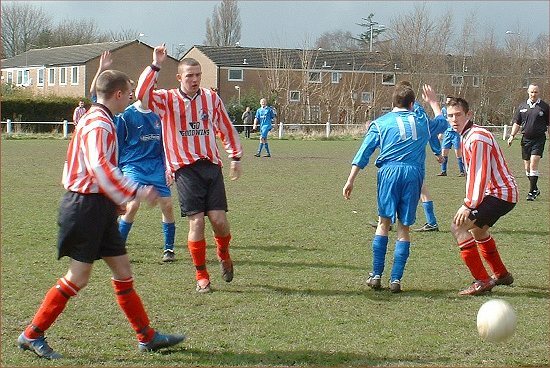 On Sunday (7th) they are at Ashton Athletic's ground playing the Open Cup Final against Marine (2.30pm). The dates for Alty Youth's three remaining cup finals have been set - and one of them, the Subsidiary Cup Final, is to be a two-legged affair. Also, the Bootle league match has been confirmed for this Sunday. The updated fixtures are here. There is now a report on the win over Kingsley last Sunday, here. 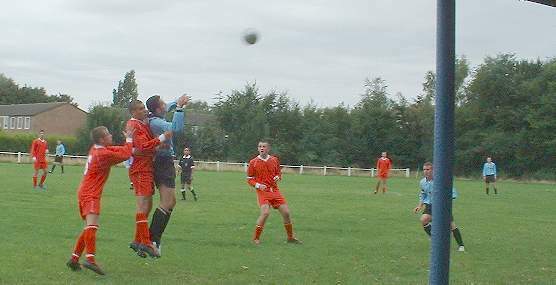 Above: Astley Mulholland in action against Kingsley. Behind him is Dean White. Altrincham's opponents in the NW Allied Trophies League, Premier Subsidiary Cup Final will be Woodley Sports, who overcame Bootle in the other semi-final, yesterday. Above: ALTRINCHAM FC YOUTH TEAM seen before Sunday's game are, BACK ROW, Tony Spilsbury (coach), Rick Crawford, Michael Risk, Dean White, Reza Zareh-Ourang, Lewis Bishop, Tom Barclay, Danny Chebrika, Ben Shanks-Pepper, Ashley McGrath, Hassan Zareh-Ourang, Danny Gray, George Heslop (manager). FRONT ROW, Astley Mulholland, Andy Keogh, Ben Deegan, Richard Gresty (capt), Matty Williams, Anthony Davies. Altrincham FC Youth's players reached their fourth cup final of the season on Sunday, defeating Kingsley United 2-1 in the NW Allied Trophies League, Premier Subsidiary Cup Semi-Final. A report on this match will follow on the website. They are also in the Open Cup Final and the Neil Thomason Memorial Trophy Final, having already won the Cheshire FA District Youth Cup as the Altrincham & District FA 's representative side. Alty's first goal on Sunday came from Ben Deegan , his fiftieth of the season in all competitions in a season disrupted by injury and suspension. The second came from Astley Mulholland, who made his Altrincham Reserves' debut last Friday. Above: Alty's defensive wall turns to see Morecambe score, with a direct shot from a first-half freekick. A depleted Alty Youth side went down 2-5 on Wednesday night in a league match. Alty's goals came from Matty Williams and Ashley McGrath. Match report here. George Heslop's report on Alty's Open Cup win at Eagley is here. Alty Youth's players reached their third cup final of the season on Sunday with a 5-3 win at Eagley in the NW Allied Trophies League Open Cup semi-final. Alty trailed 2-0 into the second half but goals from Keogh, Deegan, Mulholland (2) and Crawford secured the win. Report to follow. Alty have already reached the Neil Thomason Memorial Trophy and, playing as the Altrincham FA Youth side they recently won the Cheshire FA District Youth Cup Final. They have a chance to reach a fourth final next Sunday in the Premier Subsidiary Cup when they meet Kingsley United at Wythenshawe Town FC. Alty youth are away today at Eagley in the Open Cup semi-final. George Heslop's report on the Youth team's win over Woodley last Thursday is now here. A number of Alty Youth players have enjoyed representative success in the past week. On Monday (10th), Richard Gresty, Ben Deegan and Andy Keogh were in the NW Allied Trophies League representative side which won the Lancashire FA Under-18s Youth Inter-League Competiton Final at Leyland, retaining their trophy in the process. They beat Preston & District League 5-1, (HT 3-1), with Ben Deegan one of the goalscorers. The team's physio was Julianne Gresty who is also Alty Youth's physio, whilst the joint manager was Alty Youth's boss, George Heslop, who shared the job at Leyland with Morecambe's Dickie Danson. Then, on 12 April, Richard Gresty helped the North of England Colleges team to beat a Sheffield Wednesday youth team 3-1 in a friendly match. Today's NL Paper has a brief report on the game. A report on Alty's 7-2 win at Eagley last week is here, courtesy of George Heslop. In this game, Alty scored their 100th goal of the season. Alty Youth beat Woodley Sports Youth 4-1 tonight in the Subsidiary Cup, with two goals from Matty Williams, one from Ben Deegan and one from Tom Barclay. They now meet Kingsley United at home in the semi-final. The other semi will be Woodley or Leigh away to Bootle. Report to follow. The FA confirms that Michael Risk has been banned for two games from 10/04/2006. L to R: Alty Youth team's Dean White, Andy Keogh and Hassan Zareh-Ourang pictured in the match against Fleetwood Hesketh on Sunday afternoon - before the hailstorms struck. Altrincham Youth followed up the seven goals in their last match with a 6-0 victory over Southport side Fleetwood Hesketh on Sunday afternoon. The game started and finished in sunshine but, in between, strong hailstorms lashed the pitch. Ben Deegan hit four of the goals with Astley Mulholland and Danny Browne also scoring. Thursday 13th April at 6.30pm at Wythenshawe Town, Altrincham Youth v Woodley Sports in the Subsidiary Cup. Sunday 16th April, away at Eagley in the Open Cup. Alty Youth won 7-2 tonight, away at Eagley in a league match. Report to follow. There is now a report on the District Cup Final victory by Altrincham and District FA, here. Altrincham and District FA captain Richard Gresty holds aloft the Cheshire FA District Cup. Altrincham and District FA Youth deservedly beat Stockport and District FA today 3-1 in the Cheshire FA District Cup Final at a soggy Moss Lane. The Altrincham FA team was made up entirely of Altrincham FC players and is managed by George Heslop and his assistant, Tony Spilsbury. Alty's goals came from Matty Williams (2) and Anthony Davies, whilst Stockport's reply was a penalty by Mark Haslam. Report to follow. Matty Williams (in yellow) tries to charge down a Stockport clearance in the Cheshire FA District Cup Final. 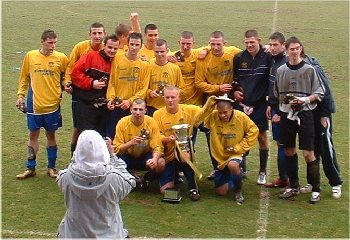 Pictured above is the Altrincham & District FA Youth team, winners of the Cheshire County FA District Youth Cup Final, 2006. Left to right back row: Rick Crawford, Kieran Raynes, Danny Chebrika, Danny Browne (partly hidden), Anthony Davies, Michael Risk, Dean White, Tom Barclay, Andy Keogh, Ben Deegan, Hassan Zareh-Ourang, Lewis Bishop, Ashley McGrath (hidden). Front row: Matty Williams, Richard Gresty and Astley Mulholland. The photographer with her back to camera is physio, Julianne Gresty. Alty Youth captain Richard Gresty has been selected for the North of England Colleges' squad as they prepare for a game against a Sheffield Wednesday youth side. Richard and team mates Ben Deegan and Anthony Davies have also been selected for the Cheshire FA's squad for its next game. Alty Youth's fixtures now include a rearranged league match with Fleetwood Heasketh and the latest list can be found here. Alty press forward in the second half against Fleetwood Hesketh. Altrincham Youth beat Fleetwood Hesketh Youth 3-0 today to secure place in the final of the Neil Thomason Memorial Trophy. The last week has been a busy one for Alty youth striker Ben Deegan. As well as training with Lincoln City and signing Conference forms for Altrincham, Ben hit the first goal for the Cheshire County FA side in their 2-1 win over Manchester County FA last Wednesday in the Northern Counties Cup match at Brantingham Road. Also in the Cheshire side was Alty captain Richard Gresty whilst an unused sub was Anthony Davies. Indeed, Ben's headed goal came from a pass by Richard. Playing against Cheshire was another Alty man, Daniel Gray, who was marking Ben Deegan, whilst Alty defender Ashley McGrath was an unused sub for Manchester. Another Alty connection in the game was that the Cheshire physio was Julianne Gresty, who is also Alty Youth team's physio and Richard's sister. For the second Sunday running, an Alty Youth home game against Fleetwood Hesketh had to be postponed in strange circumstances. Last week, the Southport based side could not travel to Altrincham for a league game due to snow at their end; this week they arrived but the referee and officials did not. Although Alty Youth manager George Heslop managed to locate another referee within half an hour of the scheduled 2pm kick off, Fleetwood Hesketh were not prepared to play this Neil Thomason Trophy semi-final, as is their right, because volunteer linesmen would have had to be used. Though the pitch at Wythenshawe Town is playable today, Alty Youth's opponents from Southport, Fleetwood Hesketh, are unable to get there because of four inches of snow in the Southport area. Therefore the match has been postopned. Lincoln City have approached Altrincham FC about two of our youth team's strikers, Ben Deegan and Matty Williams. Both lads are travelling to Lincoln on Tuesday and will train with The Imps from Wednesday to Friday; they will also take part in a game between Lincoln City Youth and Rotherham Utd Youth, this Saturday. The updated Allied Trophies Premier Division league table has been added to the site. Manager George Heslop's report on the win at Leigh last Sunday is here. Alty Youth are also in the semi-finals both of the Open Cup (away to Eagley) and of the Neil Thomason Memorial Trophy (home to Fleetwood Hesketh). Next Sunday (March 5th), they are away to Marine in the league. The league fixture grid has been updated, courtesy of George Heslop. Alty Youth play on Sunday (26th) in the Premier Subsidiary Cup, Group A away to Leigh RMI (k.o. 2pm) at Tyldesley RUFC, Astley Street. 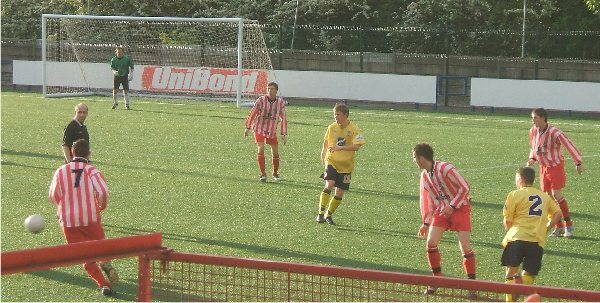 Above: Bootle head for goal against Alty Youth in Sunday's Open Cup match, which Alty won 1-0. The FA confirms two Alty Youth suspensions, though the player their website calls "Kichael Pisk" is actually Michael Risk! Perhaps, the referee's handwriting was not clear? Michael was harshly sent off against Bootle a week ago and, after the final whistle, Youth striker Ben Deegan (right) also received a second card and is therefore also banned. Both men receive a one-match ban. The bans are effective from 19 February. Altrincham & District FA will meet Stockport & District FA in the Cheshire County FA District Youth cup final at Moss Lane on Sunday 2nd April. In an entertaining game played in constant rain, Altrincham defeated their Bolton opponents thanks to goals by Zareh-Ourang, Mulholland (2), Keogh and Crawford. Report here. Ian Siddall, who refereeed last Sunday's controversial youth match against Bootle, was the linesman for the second half of Altrincham's first-team Conference match yesterday against Cambridge United. The original referee was unable to appear for the second half, so Mr Siddall, the fourth official, was pressed into action. A very physical Bootle side beat Altrincham Youth 1-0 on Sunday afternoon, thanks to a single first-half goal. Despite conceding seven yellow cards for a series of robust challenges, the Merseysiders were allowed to keep all eleven men on the pitch despite having several repeat offenders. However, Alty who, until the closing minutes when Deegan was cautioned, had only one player booked, saw centre-back Michael Risk harshly dismissed at the start of the second half for his second offence. A brief report of last month's friendly against Macclesfield Town Academy has also been added here. Tomorrow's Altrincham Youth team match against Fleetwood Hesketh Youth has been postponed as three Altrincham players (Andy Keogh, Ben Deegan and Richard Gresty) have been called up for the inter-league match against Bolton and District this weekend. Following their 12-0 win over ten-man Furness Rovers recently, Alty won the return fixture in Cumbria 8-0 on Sunday, the goals came from Hassan Zareh-Ourang who hit a hat-trick, (including two fine strikes from outside the box), two goals each from Ben Deegan and debutant Richard Crawford, and Astley Mulholland scored the other goal. Report to follow. In last Saturday's Youth FA match, Cheshire lost 2-1, away to Lincolnshire, after leading 1-0 at the interval. Alty's Ben Deegan and Richard Gresty were in the Cheshire squad. In last Sunday's friendly away to Macclesfield Town, Alty Youth went down 3-2. Alty's goals came from Astley Mulholland and Matty Williams. This Sunday Alty are away at Furness Rovers in the league. Next Sunday, they entertain Fleetwood Hesketh (Southport) at Wythenshawe Town (2.30pm). As the Allied Trophies Premier Division, in which Altrincham Youth play, has lost two clubs through resignation this season, the League has acted to fill in vacant fixture dates by creating a new cup competition, the Premier Subsidiary Cup. The remaining ten clubs in the Division have been split into two groups of five. Each club will have two home and two away matches and the winners will meet in the final. Alty have a tough draw, having Morecambe A, Woodley Sports, Leigh RMI and Eagley in their group. This means that Alty now play both Eagley and Bootle three times before the end of the season. The updated fixtures are here. Alty youth players Ben Deegan and Richard Gresty were playing for the Cheshire FA yesterday against Lincolnshire. Also, Anthony Davies has been invited to join the County squad for their next game. Courtesy of George Heslop, the Allied Trophies Premier Division results' grid has been updated, here. Three ex-Alty Youth players are in the first-team squad this season (Kieran Lugsden, Lewis Chalmers, Lee Hendley) and several have already played for the Reserves. But a youth team costs money to run and this year Alty fans can help by joining the Monthly Draw Club organised by Pam Gresty, mother of Alty Youth captain, Richard Gresty and of their physio, Julianne. The current Alty Youth squad, managed and coached by George Heslop and Tony Spilsbury, is doing well in the Allied Trophies Premier Division and is also successfully providing all the players to the Altrincham & District FA youth side, which has reached the Cheshire FA District Final. Several Alty players are also regulars in this year's Cheshire FA representative side. Details of the Draw Club scheme are here. For just £5 a month you can win cash prizes; the winners of the four prizes in December were, in order, Graham Rowley (£35), Pam Gresty (£20), Terry Surridge (£10) and David White (£5). Furness arrived with only ten players and played the last fifteen minutes with only nine but even with a full eleven would have struggled against Altrincham today. Alty's scorers were Matty Williams, Danny Gray (2), Curtis Connell (3), Dean White (3), Ben Shanks-Pepper, Anthony Davies and Astley Mulholland. Match report here. The Allied Trophies Premier Division fixture grid and league table have been updated, courtesy of George Heslop,. The January/February league fixtures have been amended and a friendly against Macclesfield Town has been added to the list. Anthony Davies goes for the ball against Woodley, watched by Hassan Zareh-Ourang (left) and Matty Williams (right). Alty Youth lost 5-2 away at Woodley Sports this afternoon. Matt Williams and Astley Mulholland netted Alty's goals. Match report here. Above: Andy Keogh contests for the ball with Kingsley keeper Nolan. In a game of two halves today at Wythenshawe Town, Alty Youth beat Kingsley United 2-1. After missing several chances Alty took a deserved half-time lead though Keogh and Williams before Kingsley had the better of the second half but could only score in the first minute of added time. Alty's Danny Gray and Ashley McGrath were in the Manchester County FA side playing in the inter-county knock-out competition this weekend. Cheshire FA, which included Richard Gresty, Ben Deegan and Tom Bane are already in the final eight at which stage Manchester hope to join them. Cheshire have a home tie on the next round. Courtesy of George Heslop, the Youth team's league fixture grid has been updated here. Sunday's youth team cup game against Bootle has been postponed due to the heavy rain today (Saturday). Tomorrow (Sunday) from 1pm to 5pm the Altrincham FC Christmas Fair will be held in the Sponsors' Lounge at Moss Lane. Please do come along if you possibly can to support this important fundraising event - and don't forget there will be a chocolate tombola stall there! The Allied Trophies Premier Division table is here, courtesy of George Heslop. The youth team player statistics have been updated, courtesy of George Heslop. Alty's opponents at home in the semi-final of the Neil Thomason Trophy will be Fleetwood Hesketh, who beat Woodley at the weekend. The next Alty Youth match is this Sunday at home to Bootle in the Open Cup quarter-final at Wythenshawe Town - NB this is a 1.30pm kick-off to allow for extra time and penalties before the light fades. Courtesy of manager George Heslop, there is now a brief report on the defeat, away, to Leigh RMI on 13 November, here. Virtually all of Altrincham Youth's remaining league fixtures have been altered due to the resignation from the NW Allied Trophies League of Lancaster City. The revised fixtures are here. Alty right-back Tom Barclay (in blue, left) jostles for the ball as Astley Mulholland and Richard Gresty prepare to assist in the game against Leigh RMI. Two late goals saw Alty Youth win 3-2 in the Neil Thomason Trophy against Leigh RMI this afternoon. Trailing 2-1 with seven minutes left, Andy Keogh equalised and then Ben Deegan fired home the winner. Ben also scored Alty's opening goal and he has now equalled the Altrincham Youth goalscoring record of 34 youth goals in a season, held by Lee Hendley - and it is still only November! In all this season Ben Deegan has now scored 27 goals for Altrincham Youth and Altrincham FA and six times for the Cheshire FA side. 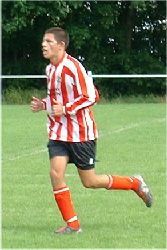 In addition, he has netted once for Alty Reserves. Cheshire FA Youth beat Berks & Bucks FA Youth 3-0 on Saturday at Thatcham Town. Alty's Ben Deegan scored one of the goals and both Tom Bane and Richard Gresty also played. 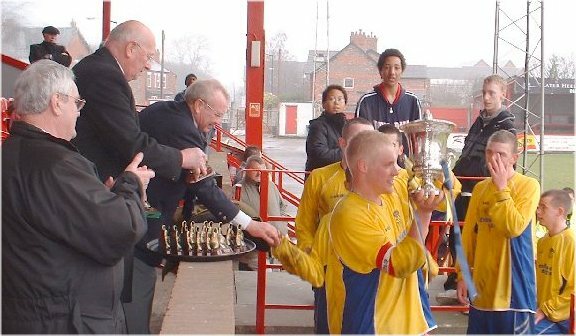 The Youth team's Neil Thomason Memorial Trophy match at home to Leigh RMI has now been re-instated and will be played tomorrow (27th) at Wythenshawe Town - kick off is at 1.30pm. Another change is that next Sunday (4th) Alty Youth will be at home to Bootle in the Open Cup, also at Wythenshawe Town at 1.30pm. Ben Deegan, Tom Bane and Richard Gresty are all in the Cheshire FA squad for this week's match away to Berks & Bucks FA in the national inter-County competition. Above: Ben Deegan (left in yellow) keeps his eye on the ball as Anthony Davies (no.11) stands by, on a cloudy afternoon at Trafford. Altrincham & District FA youth team, entirely comprising Altrincham FC Youth players, today (Sunday) beat Chester & District FA Youth at Trafford FC by six goals to nil. They are now in the Cheshire FA District Cup Final against Stockport & District FA to be played in March, at a venue to be confirmed. Fresh from scoring twice in Saturday's Cheshire FA's 6-3 win over Liverpool FA in the Northern Counties group-stage match this weekend, Alty striker Ben Deegan hit a hat-trick against Chester. He has now scored 25 goals for Altrincham Youth and Altrincham FA this season as well as netting once for Alty Reserves and six times for the Cheshire FA side. The other scorers against Chester were Matty Williams, Astley Mulholland and Andy Keogh. Alty's Tom Bane also scored in the Cheshire FA match against Liverpool in which Richard Gresty also played. And, still on the representative front, in the mid-week inter-league match between the NW Allied Trophies League and the Bury & Radcliffe League, Alty's Andy Keogh played. The Cheshire FA reports that "Cheshire entertained Liverpool in a Division One Northern Counties Youth Cup fixture at Christleton on Saturday [19th Nov]" and has a match report on the game during which Alty's "Tom Baines [i.e. Bane] curled a 20-yard free kick over the Liverpool wall, and into the far corner of the net" before his Alty colleague Ben Deegan scored two goals. Cheshire won 6-3. The site also has squad details. Following Formby's recent departure from the Allied Trophies Premier Division, Lancaster City has now withdrawn its youth team from the league. The scheduled Neil Thomason Memorial Trophy, Round 2 match between Altrincham and Leigh set for 27 November has been postponed due to a fixture clash for Leigh. Alty's next game is this Sunday (20th) when they represent Altrincham & District FA against Chester FA at Shawe View, Trafford FC, k.o. 2pm, in the District Cup, with a place in the final at stake. Alty Youth lost 2-0 away to Leigh RMI on Sunday. Report to follow. Sunday's youth team game away to Leigh RMI hs been switched from Pennington FC to St George's Park, the ground of Tyldesley RUFC at Astley Street, Tyldesley. In League 2 of the Cheshire County FA's District Cup, Stockport FA have qualified for the Final. Altrincham & District FA hope to join them by winning League 1, but they need to get points from Chester FA next week before they can do so. Courtesy of information from George Heslop, the Youth team player statistics, fixtures and fixture grid have been updated- please follow the links towards the top of this page. In the Cheshire County FA District Youth Cup, Alty lead League 1 with six points from three games - it is still two points for a win in this competition. Only the Wirral FA can catch them; they have 4 points, also from 3 games. Alty's final qualifying match is against Chester FA on 20 November. Leading the other qualifying group (League 2) are Stockport and Crewe, each with 4 points from 3 games. Macclesfield are not yet out of it, with 3 points. The heavy rain has caused the postponment of today's Youth game v Furness Rovers. If Youth team manager George Helop is seen with a foreign language phrasebook this week it is just a by-product of the internationalization of English football. Last Sunday's youth match was refereed excellently by Japanese referee Hiro and this Sunday's was due to be reffed by Frenchman, Monsieur Claude Duval. Please do consider helping the Altrincham Youth team by joining the new Monthly Draw Club organised by Pam Gresty, mother of Alty Youth centre-back, Richard Gresty and physio Julianne. The Youth team is a vital part of Altrincham FC and has produced three of the current first-team squad - Kieran Lugsden, Lewis Chalmers and Lee Hendley. The current Alty Youth squad is riding high in the Allied Trophies Premier Division and is also doing well as the Altrincham & District FA youth side. Several Alty players are regulars in this year's Cheshire FA representative side. Details of the Draw Club scheme are here. You can see the lads in action (weather permitting) on Sunday (6th, 2pm) against Furness Rovers at Wythenshawe Town FC . Courtesy of George Heslop, a brief match report on last week's win at Kingsley has been added to the site, here. Altrincham Youth now have a home league game this Sunday (6th) against Furness Rovers. This will be at Wythenshawe Town at 2pm. Another fixture change sees the match the following week (13th) switched from an away league game at Woodley to an away match against Leigh RMI at a venue to be confirmed. George Heslop would like to thank all those who supported last week's Race Night in whatever capacity, be it as sponsors, attendees, etc. Once all the monies have been collected, the event is expected to have raised in the region of £575, which will go towards the Youth Team's running costs. Details will appear here shortly of a new fundraising scheme for the youth team which is being organised by Pam Gresty. Our Allied Trophies' colleagues, Eagley FC, have a new website. The links page of this Altrincham official site has been updated and website links to Eagley, Furness Rovers and Fleetwood Hesketh have all now been added to it. Another four goals for Ben Deegan took Alty up to second in the NW Allied Trophies Premier Division today. Anthony Davies and Andy Keogh were the other scorers but man of the match was Astley Mulholland who laid on four goals. Report to follow. Formby's Youth team has withdrawn from the NW Allied Trophies League. As a consequence, Altrincham's league fixtures have ben amended and, some of these are here. An immediate consequence is that Alty get a bye in the Premier Cup (Neil Thomason Trophy). Alty now play at home to Leigh RMI in the 2nd round on November 27th. Before than Alty have no game on Nov. 6th, are away at Woodley on Nov. 13th and play for Altrincham & District FA v Chester FA on Nov. 20th. Altrincham FC Youth team held an enjoyable fundraising Race Night on Friday at Moss Lane. Compered by Youth Manager, George Heslop, many of the youth team were in attendance as were first team boss Graham Heathcote and youth coach Tony Spilsbury. Jenny Heslop did her usual excellent job behind the bar whilst Andy, the Race Night host, ensured the night ran smoothly. Many thanks are also due to all the parents and others who supported the event. Fleetwood Hesketh v Woodley S./Furness R.
In the Allied Trophies Open Cup, Alty are at home to Bootle in the quarter-final on 18 December. The other ties are : Marine v Morecambe B; Morecambe A v Prestwich Heys and Eagley v Blackrod T/Leigh RMI. After taking a lead inside 20 seconds through Matty Williams and being 2-0 up after 15 minutes following an overhead-kick goal from Hassan Zareh-Ourang, Altrincham & District FA were made to work hard to hold onto a 2-1 winning scoreline today against Runcorn & District FA in the Cheshire FA's District Youth Cup match at Trafford FC. Cheshire FA has a report on how "The Cheshire FA Youth Team became the first County to progress to the Third Round of The Football Association County Youth Cup on Saturday [15th Oct], when they defeated North Riding FA 2-1 with a 112th minute extra time goal from captain Ben Deegan (of Altrincham)...As the visitors applied more pressure great defensive work by Cheshire’s Woodridge and Gresty (Altrincham) in particular protected the home goal... The deadlock was broken when captain Ben Deegan fired home from 12 yards". The Cheshire FA also has updated page on the District Cup. Courtesy of George Heslop, there is now a match report on the win at Holker Old Boys in the Open Cup, here. The next round game, at home to Bootle, will be on 18 December at 2pm. Altrincham FC Youth have no game next Sunday but instead they will represent Altrincham & District FA against Runcorn & District FA in the Cheshire FA's District Cup at Shawe View, Trafford FC, on Sunday (23rd) at 2pm. Entry is free so please come along and support the lads. Including Ben's goals for the Cheshire and Altrincham FA teams and for Altrincham FC, he has now hit 21 goals in 11 matches. Altrincham Youth are now third in the Allied Trophies League table, which is available on the Yellow Jersey website. A match report on the Altrincham & District FA Youth team's excellent win on the WIrral on Sunday is here, courtesy of manager George Heslop. George would like to encourage as many supporters as possible to support both the Altrincham & District FA side and the Altrincham FC teams, all of whose fixtures are here. Altrincham FC Youth team is holding a fundraising Race Night on Friday 28 October in the Noel White Suite at Moss Lane, starting at 7.30pm. Admission will be just £1. Manager George Heslop promises a great night all for all, so please come along and help to support the youth set-up which has already produced three of our current first-team squad (Kieran Lugsden, Lewis Chalmers and Lee Hendley). If you would like to sponsor a race (£25) or a horse (£5) please contact the club on 928-1045. Details here. A fixture grid for Altrincham FC' youth team's league games has been added to the website as has the player statistics grid, both courtesy of George Heslop. Goals from Deegan (2), Williams, Gresty and White saw Alty reach second place in the Allied Trophies league on Sunday. Visit Yellow Jersey for the update table. Alty Youth captain Ben Deegan scored twice for the Cheshire FA site in their recent 6-0 win over the Isle of Man. Also in the Cheshire side was Alty defender Tom Bane. Cheshire now meet the North Riding at home. Following last Monday's trip to Selby, Alty Youth now have a further nine successive away league/cup games as well as three matches away from their Wythenshawe Town base for those of their players representing the Altrincham & District FA team. Alty's next scheduled home league game is in January 2006! On Sunday (2nd Oct) they are away at newcomers Fleetwood Hesketh in Southport. After that the nearest to a home game in the rest of 2005 will be two Altrincham FA matches at Shawe View, Trafford. It is possible that the fixtures may change again or that a cup draw will place Alty at home. The revised fixtures are here. Altrincham bowed out of the FA Youth Cup tonight at Selby after giving a disappointing performance. They took the lead through Deegan's header, only to lose the match to two defensive errors. A report on Alty's win over Leigh is here. From Leeds, left at main traffic lights in Selby down Scott Rd, then 1st left into Richard St.
From Doncaster, go straight across main traffic lights into Scott Rd then 1st left. From York, right at main traffic lights into Scott Rd and 1st left. Map of the Selby Town FC ground area. Alty's FA Youth Cup match away at Selby Town will be on Monday 26th September at 7.45pm. As a consequence the game on Sunday 25th against Formby has been postponed. A report on Alty's win over Marine is here. The Allied Trophies NWYA Premier Cup has been re-named the Neil Thomason Memorial Trophy to acknowledge the achievements of former Alty coach Neil Thomason, who tragically died at an early age this summer whilst on holiday. The revised Alty Youth fixture list is here. Two Alty Youth players, Tom Bane and Ben Deegan have been included in the Cheshire County FA Youth squad to face Lancashire FA next weekend in the NW Counties Challenge Cup. Above: Dean White gives Astley Mulholland a helping hand against Marine. In an entertaining game, Alty ran out winners thanks to goals from White, Williams and Connell. Report to follow. The Marine website says that "The Youth team suffered their first defeat of the season as they went down 3-1 at Altrincham. Lewis Crosbie scored the Mariners only goal". Alty's next game is at home to Leigh RMI on Sunday 18th. RMI are advertising for new players from Year 11 "who want to join the professional ranks... In short we are looking for the next Liam Coyne, our 18-year-old prodigy who made his first team debut in the Conference National at 17". Liam was formerly at Altrincham. Alty too have their teenage prodigies in the likes of Lewis Chalmers, Kieran Lugsden and Lee Hendley who have all played Conference National football this season after being in the Alty Youth side. The Alty league fixtures have changed substantially from those first issued due to the following changes in the Allied Trophies NWYA League. George Heslop will supply the changes to me this weekend for posting here. First Touch Halewood and Euxton Villa were voluntarily relegated to Division One as they had young sides this season. Fleetwood Hesketh joined the Premier Division. Barrow Youth folded and were replaced by Furness Rovers. So, Alty's game this Sunday (11th) is now at HOME to Marine and not away to them. Kick off is 2.30pm at Wythenshawe Town FC. The Woodley Youth team has its own website and a report on the recent win against Alty. Above: Ben Deegan's 24th-minute free-kick is well saved by Ball at the expense of a corner. Alty Youth impressively beat Lancaster City 6-0 yesterday. The goals came from Davies (26), Mulholland (30), Keogh (64), Deegan (70,81) and Williams (77). Report here. In a game of two 40 minute halves (as a result of the match officials' late arrival), Alty Youth allowed a 3-1 lead to slip at home to Woodley Sports on Thursday night and went down 4-3 after conceding three second-half goals. Match report here. 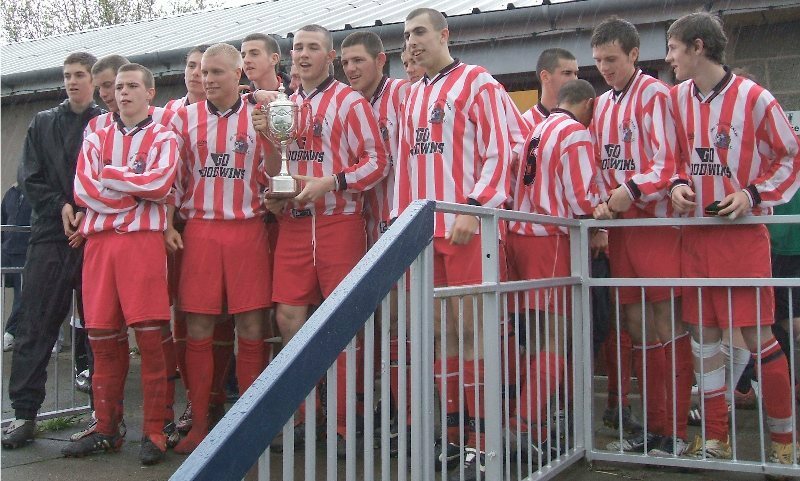 The site also has an interesting history of the North West Youth Alliance league, of which Alty Youth were founder members in 1998 and winners of the inaugural championship. Aty Youth drew their first game of the season, away at title holders Morecambe "A", 2-2, today. The home game with Woodley Sports is now next Thursday (25th) at 6.15pm and not Tuesday at 6.30pm as originally announced. Alty Youth's game at West Didsbury on Sunday (14th) has been cancelled, as the hosts cannot raise a team. Match report here, courtesy of manager, George Heslop. Alty Youth were beaten 3-1 by Macclesfield FA in the semi-final of the Umbro International Tournament youth section on today. In the final, Daisy Hill, whom Alty had beaten in the qualifying league, defeated Macclesfield 2-0 to lift the trophy. Some two hundred people attended former Alty Youth coach Neil Thomason's funeral on Friday at Altrincham crematorium, including many of his former youth players. Neil, though born in Sale, had spent the first 13 years of his life in India and, at a gathering held at the club after the funeral, his family had compiled a fascinating photo tribute to his life including his old Indian school reports and pictures of his involvement with Altrincham FC youth team. Alty Youth play in the Allied Trophies League and Steve Parkinson, club secretary of Euxton Villa and manager of their Youth team will be updating the league fixtures and results on the Yellow Jersey website this season. Within the site, select football > Lancashire > Northwest Allied Trophies League. Wins on Thursday over Daisy Hill (2-0) and Wilmslow HS (2-1), plus a 2-0 win on Friday over London side FC Baresi allowed Altrincham FC Youth to qualify for the semi-finals of the Umbro Youth tournament in Manchester. Because of the bad weather this week, the games yesterday were reduced from 35 to 25 minutes each half. The semi-final and final will both be played tomorrow. From Alty Youth's league rivals Leigh RMI comes news that "Richard Chetcutti RMI youth team's prolific striker could be on his way to Chelsea. This distinct possibility has arisen by virtue of his excellent football skills that enabled him to win the regional finals of a national competition. He heads south on an all expenses paid weekend to meet up with the other regional finalists at Chelsea’s’ impressive training centre. They will compete for the impressive prize of a 2-year professional contract with the Premier League champions". But "Richard is not the only RMI youth player under league club scrutiny; their talented central midfield player Craig Hobson is attracting attention from Bury". Six Alty Youth players have bee called up for Cheshire FA Youth trials. They are Ben Deegan, Hassan Zareh-Ourang, Graham Bryant, Richard Gresty, Ben Shanks-Pepper and Matty Williams. There is a report, courtesy of George Heslop, on the Youth team's friendly win (3-1) at Warrington Town on Sunday here. The league fixtures up to mid-February, as well as the league cup draws, are here, courtesy of George Heslop. 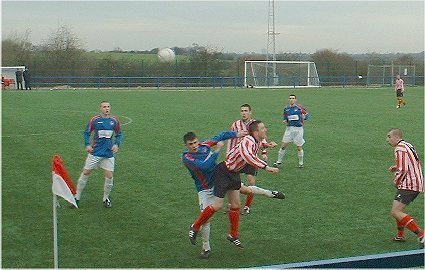 The final league table for the NW Allied Trophies Football League Premier Division for 2003-05 is now avialable, courtesy of George Heslop, here. If you hold a valid driving licence and would be willing to help the Youth Team with driving a minibus to away games, please contact manager George Heslop via the club (0161-928-1045). It is with the deepest regret that we have to record the sudden and very premature death of Neil Thomason who, until the end of last season, was the coach to Altrincham FC's successful youth team. Neil (aged 42 or 43) died on Wednesday whilst on holiday in Tenerife. The deepest condolences of all at the club go to Neil's wife and family as well as to all the lads who benefited from his skills and knowledge in the Altrincham youth set-up. In partnership with Alty youth team manager George Heslop and, more recently also with Tony Spilsbury, Neil was a major factor in the success of the Altrincham youth team over recent years. As well as his coaching duties, Neil performed virtually every task imaginable in connection with the youth team, including minibus driving to away games, serving as physio and off-field fundraising. He was a very popular figure both amongst his youth team colleagues and players but also, more widely, at Moss Lane. Because of his work commitments with BT, Neil had had to resign from his role with the youth team at the end of last season but, knowing Neil, he would no doubt have continued to give every assistance possible to George, Tony and the youth players over future years in an unofficial capacity. On a personal note, Neil was a great help to this website and his lively banter from the touchline always made youth team games pleasurable to attend. 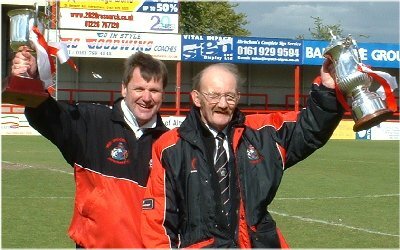 Neil is pictured above (left) at the end of the 2003-04, with George Heslop (right), displaying the league and cup trophies won by Altrincham FC that season. Neil's outstanding contribution to the youth team was marked on 28 May this year when a well-deserved presentation was made to him at the Youth Team Presentation Night to mark his retirement as coach.